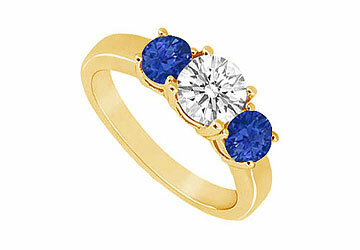 Two cool blue sapphires are prong-set beside a brilliant-cut round diamond. These three stones are a symbol of your past present and the future. Made in 14K yellow gold this ring has a total gem weight (TGW) of 1.00 ct. Available Ring Sizes: 4.0| 4.5| 5.0| 5.5| 6.0| 6.5| 7.0| 7.5| 8.0| 8.5| 9.0| 9.5| 10.0| and No Extra Charge for Ring Size.